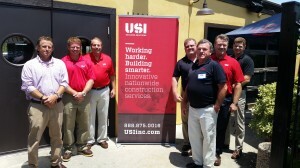 Last month, USI Champion Insulation held an event called the “Spray Foam Lunch & Learn” and invited builders from the greater Houston area to come and learn how to educate homeowners on the benefits of spray foam insulation. 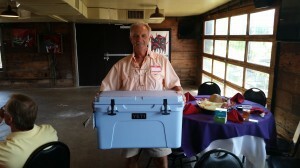 Two lucky attendees won YETI coolers, which USI gave away during the event. YETI coolers also use spray polyurethane foam technology for maximum insulation. Jason Penberthy of Mission Custom Builders and Tim Kurtin of Kurtin Fine Homes were the winners. Mike Carpenter, pictured far-left, in below photo, delivered an overview of spray foam insulation, which is the most advanced, energy-efficient insulation and air sealant available today. 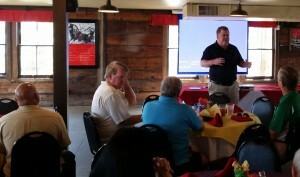 Carpenter delivers these presentations at many USI branches across the country and caters them to local building codes, climates and anything else that is unique to the particular geography and building climate. The focus of his presentation is on clearly illustrating the benefits and impact that spray foam has on new construction. Branch manager Pat Dwyer said that his team is dedicated to installing the energy-saving technology throughout the Houston area and wants builders to know the differences between open and closed cell spray foam. Dwyer invited builders and their A/C contractors and framers as well, and was prepared to answer questions as it relates to their areas of expertise. 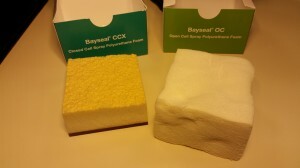 Dwyer also gave out samples of Bayseal open-cell (OC) and Bayseal closed-cell (CCX) SPF insulation from Covestro so that attendees could see, and touch, the differences. Every USI spray foam installer is required to pass the USI building science spray foam training program and certification program to qualify to be on customers’ job sites. For more information on spray foam insulation, contact USI online to get a free quote. USI believes that excellence in every step of the process ensures timely completion and quality service, time after time.